Originally published in 1900 from the handwritten notes of Mme. Bégué herself, this collection of dishes from a quintessential New Orleans restaurant are now available in a edited and modernized version of the 1937 edition. 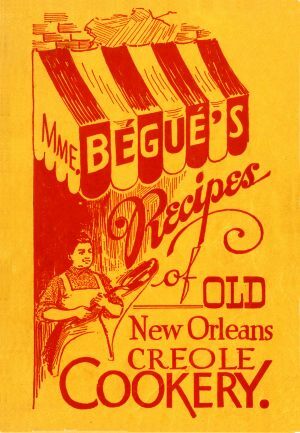 One of the first cookbooks ever published in New Orleans that became a sought-after souvenir of the Bégué’s dining experience, it has been updated with a foreword by renowned food enthusiast Poppy Tooker. Originally published as a guide for tourists wanting a taste of true Creole cuisine, it includes recipes from other well-known cooks, including Victor Bero from Victor’s Restaurant (later called Galatoire’s). Tooker recreated the most significant of Madame Bégué’s creations by providing a contemporary rendition of the original recipe. Included are such treasures as Turtle Soup, Chicken á la Creole, and Creole Gumbo. Poppy Tooker is the popular host of the radio show Louisiana Eats! and the television show Eat It to Save It! She is a classically trained chef and cooking teacher. Tooker is passionate about food and the people who make it and is tireless in her efforts to preserve and restore the food traditions of her beloved home. She strives to educate readers on the importance of reviving foods that are pivotal to the cultures of New Orleans and Louisiana. "A treasure once lost to history, this book shines light both on traditional dishes of New Orleans and the formerly famous woman who made those dishes traditional and influenced American cuisine for ever after." Click here for Chapter 1. Click here for Front Matter.